38. Still have an ancestor's home from the 19th or earlier centuries in the family. This week, I share transcriptions from The Manchester Journal (Manchester, OK). Judson Van Every, the brother of my great grandfather, Melvin Van Every, appeared often in the pages. These transcriptions were originally written down by Wayne York, a grandson of Judson Van Every. I found the transcriptions attached to an entry on an Ancestry Public Member Tree belonging to plnjmw. They are shared with her permission. The Ancestry Insider reports that the number of images at FamilySearch has surpassed Ancestry. 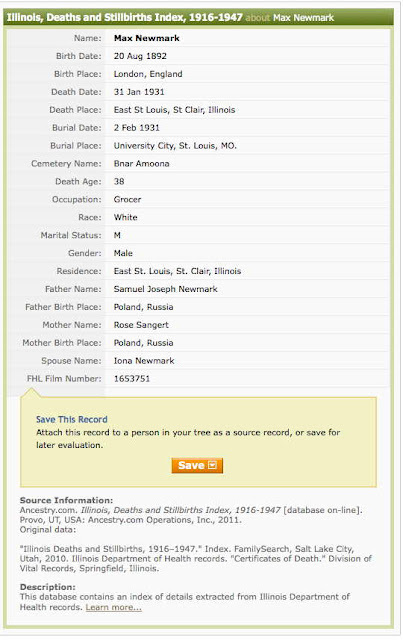 FamilySearch has a lot of images that aren't indexed. James Tanner at Genealogy's Star notes that Ancestry has a lot of indexes without images. And without the images, there's no way to verify that the record has been transcribed correctly. Diane Richard at Upfront with NGS discusses The National Archives five Tumblr accounts. The 110th edition of the Carnival of Genealogy has been released at CreativeGene. The theme: Which type of tree best represents your family history? The theme for the 111th edition is Autumn Weddings, with a deadline of November 1st. More details. The following individuals participated this past Monday in the weekly meme I began back in February of 2009: Amanuensis Monday. I apologize if I missed anyone, as I had to rely on Google to find many of the posts. It is my understanding Thomas MacEntee at Geneabloggers will be back in town and tracking participation in the daily blogging prompts tomorrow. Cheryl Cayemberg at Have You Seen my Roots? Many of those who usually appear below post on Friday. However, Randy usually does an excellent job of listing other lists.